Since 2015, opinions about the federal government’s handling of several major issues have become less positive and much more partisan. Yet majorities continue to say the government should have a “major role” on such issues as defending against terrorism and helping lift people from poverty. And views about government’s role, unlike its performance, have changed only modestly over the past two years. 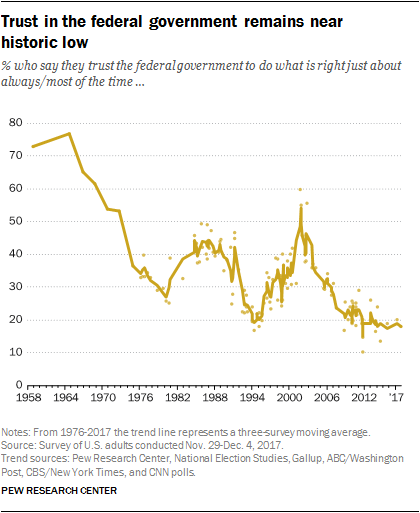 Public trust in government, meanwhile, remains close to a historic low. Just 18% say they trust the federal government to do the right thing “just about always” or “most of the time” – a figure that has changed very little for more than a decade. And while more Republicans say they trust the government today than did so during the Obama administration, just 22% of Republicans and even fewer Democrats (15%) say they trust the government at least most of the time. With a new president in the White House, the lower ratings for the federal government’s performance are driven largely by Democrats, who are much more negative today than they were two years ago. Among the public overall, positive ratings for the government’s handling of ensuring access to health care have declined 20 percentage points since 2015; today, just 36% say it does a very or somewhat good job in ensuring access to health care, down from 56% two years ago. Over the same period, there have been 15-percentage-point declines in positive evaluations of government performance in protecting the environment and responding to natural disasters. On several other issues, including the economy, terrorism and immigration, the public’s ratings of the government’s performance have changed little over the past two years. But there is no issue, among 12 tested, on which the government’s performance ratings have improved significantly. And on 11 of the 12 issues, partisan differences in these evaluations have widened considerably. The new national survey by Pew Research Center, conducted Nov. 29-Dec. 4 among 1,503 U.S. adults, updates measures on the government’s role and performance from a major study of attitudes about government conducted in 2015. Across all 12 issues, about two-thirds or more of the public say the government should have a major role. And on nearly all issues, positive assessments of the government’s performance lag well behind the shares who think the government should play a major role. Large majorities say the government should play a major role in keeping the country safe from terrorism (94%), responding to natural disasters (89%) and ensuring that food and medicine are safe (87%). Somewhat smaller majorities – about six-in-ten or more – say the government is doing at least a somewhat good job in each of these areas. In other areas, there are much wider differences between views of the government’s role and performance. For example, while 80% of the public says the government should play a major role in managing the country’s immigration system, just 32% say it’s doing a good job in this area. Similarly, two-thirds think the government should be involved in helping people get out of poverty; just 26% rate the government positively in dealing with poverty – the lowest rating for any issue in the survey. And while wide majorities say the government should be involved in ensuring a basic income for those 65 and older (71%), access to health care (69%), access to high equality education (68%) and helping people get out of poverty (67%), fewer than half say the government is doing a good job in these areas. Two years ago, with Barack Obama in the White House, more Democrats than Republicans expressed positive views of government performance in most specific areas. However, there were some issues – including responding to natural disasters and protecting the environment – on which members of both parties had similar evaluations. Today, with Donald Trump as president, Republicans are more likely than Democrats to offer positive evaluations of government performance across the board. 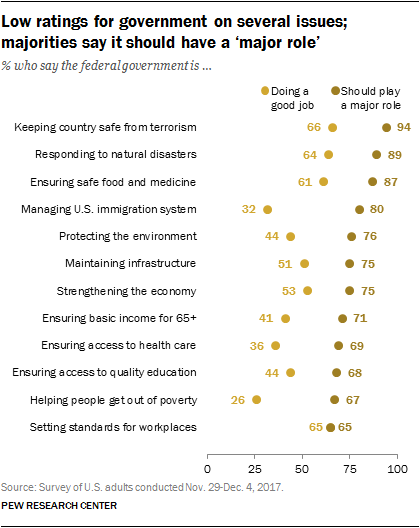 Republicans are particularly positive about the federal government’s response to natural disasters. Nearly nine-in-ten Republicans and Republican-leaning independents (88%) say the government does a very or somewhat good job responding to natural disasters, compared with 51% of Democrats and Democratic leaners. Republicans are more than twice as likely as Democrats to say the government does well in protecting the environment (71% vs. 28%). There also are sizable partisan gaps in views of the government’s performance in strengthening the economy and alleviating poverty. Notably, both Republicans and Democrats favor government involvement in managing the country’s immigration system, but just 38% of Republicans and 29% of Democrats think the government is doing a good job addressing this issue. The changes in how partisans view government performance vary across different issues. In assessments of how well the government does in strengthening the economy and keeping the country safe from terrorism, the two parties have essentially traded places since 2015. At that time, 68% of Democrats rated the government positively for strengthening the economy; just 41% do so today. By contrast, the share of Republicans who say the government is doing a good job on the economy has more than doubled since then (77% vs. 34% in 2015). On most other issues, however, Republicans’ evaluations are only modestly more positive than they were two years ago, while Democrats are far less positive. The share of Democrats saying the government does a good job in protecting the environment has plummeted 30 percentage points, from 58% to 28%. About seven-in-ten Republicans (71%) give the government positive marks for protecting the environment, up nine points from 2015 (62%). There has been a comparable decline in the share of Democrats who rate the government positively for responding to natural disasters (51% now, 82% in 2015). Republicans’ views are somewhat more positive than they were then (88% now, 78% then). Amid efforts by the Republican-led Congress to eliminate or roll back the Affordable Care Act, just 29% of Democrats say the government does a good job in ensuring access to health care; two years ago, 74% of Democrats rated the government’s efforts positively. Republicans continue to have relatively mixed views of the government’s performance on ensuring access to health care (47% positive today, 40% in 2015). While minorities in both parties offer positive ratings of the government on managing the immigration system, the share of Republicans saying the government does a good job has more than doubled since 2015, from 15% to 38%. Democrats’ views are less positive than they were then (29% now, 40% then). For the most part, partisan attitudes about the federal government’s role have not changed much since 2015. As was the case then, Republicans are far less likely than Democrats to say the government should play a major in ensuring access to health care and alleviating poverty. Currently, more than twice as many Democrats (86%) as Republicans (39%) say the government should play a major role in ensuring access to health care; the partisan gap was about as wide two years ago (83% of Democrats, 34% of Republicans). And while a large majority of Democrats (80%) continue to say the government should have a major role in helping people get out of poverty, just 44% of Republicans say the same. Nearly identical shares in both parties (76% of Democrats, 73% of Republicans) say the government should have a major role in strengthening the economy. This marks a change from two years ago, when Democrats (84%) were more likely than Republicans (64%) to favor a major role for the government in the economy. There continues to be common ground among partisans regarding the government’s role on a number of other issues. Comparable shares in both parties say the government should play a major role in defending against terrorism, managing the immigration system, responding to natural disasters, maintaining infrastructure and ensuring safe food and medicine. Only about one-in-five Americans (18%) say they trust the federal government to do what is right just about always or most of the time. Two-thirds of Americans say they can trust the government only some of the time, while 14% volunteer they can never trust the government. These attitudes have changed very little over the past decade – from late in George W. Bush’s second term, through Obama’s eight years in office, and Trump’s first year in the White House. Public trust in the federal government was high during the 1950s and 1960s, but declined sharply through the 1970s, during the Vietnam War and Watergate. Since the 1970s, there have been occasional periods of relatively high trust in government, most recently during the months after the 9/11 terrorist attacks. Yet trust in government declined through the later stages of Bush’s presidency, during the Iraq War and the financial crisis, and has never recovered. It has been a decade since as many as 30% of Americans have said they can trust the government just about always or most of the time. As with many other attitudes, partisans’ trust in government tracks party control of the presidency. The share of Republicans and Republican-leaning independents who say they trust the government at least most of the time is higher today (22%) than during the Obama administration. 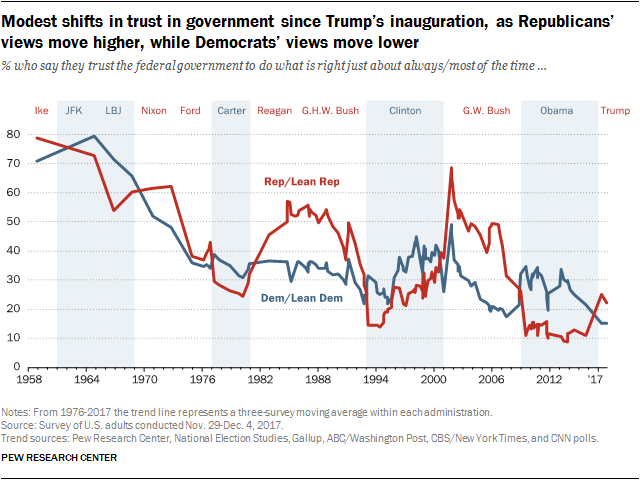 Yet the current level of Republican trust in government is relatively low compared with past Republican administrations. The share of Republicans saying they trusted the government always or most of the time was much higher during most of George W. Bush’s presidency, and throughout the entire administrations of George H.W. Bush and Ronald Reagan. Just 15% of Democrats and Democratic leaners say they trust the federal government always or most of the time, which is lower than during the Obama administration and among the lowest levels of Democratic trust in government in the past 60 years. Democrats’ trust in government was about this low toward the end of Bush’s presidency in 2008. As with trust in the federal government, there has been little change in people’s feelings toward the government. As in the past, most say they are frustrated with the government (55%), while smaller shares are angry (24%) or basically content (17%). Over the past two decades, anger at the federal government reached a high point during the October 2013 shutdown of the government, when 30% expressed anger at the government. 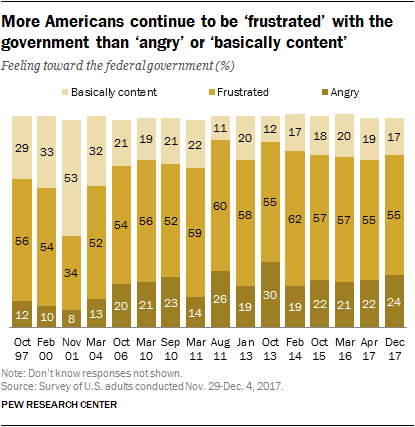 Nearly a year into Trump’s presidency, there has been a substantial increase in the share of Democrats expressing anger at the federal government. Currently, 29% of Democrats say they are angry at the government, which equals the share saying this in October 2006, before the midterm elections that year. About one-in-five Republicans (19%) say they are angry at the government, which is much lower than the share saying this through most of Obama’s administration. 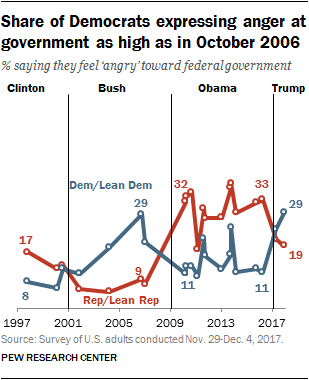 However, the share of Republicans expressing anger at the federal government is higher today than at points during the first six years of Bush’s presidency (question was not asked later in his administration). Overall, the public’s current ratings for government performance are more positive than negative on five of 12 issues, including keeping the country safe from terrorism, setting fair standards for workplaces and responding to natural disasters. 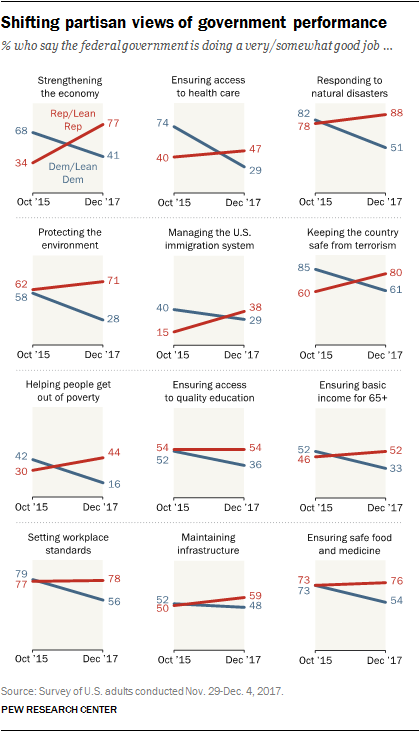 The government’s ratings on four issues – poverty, immigration, health care and the environment – are, on balance, negative. On three other issues, the public’s views are more mixed. On alleviating poverty and managing immigration, in particular, sizable proportions (42% and 38%, respectively) say the government does a very bad job. By comparison, just 6% say the government does a very good job in helping people out of poverty and 7% say it does very well in managing the immigration system. Democrats and Democratic leaners, especially liberal Democrats and leaners, are intensely critical of government performance in alleviating poverty. An overwhelming majority of liberal Democrats (87%) say the government does a bad job on this issue, with 64% saying it does a very bad job. While conservative and moderate Democrats also rate the government negatively in addressing poverty (74% say it does a bad job), about half (46%) rate its performance as very bad. Republicans and Republican leaners are divided in views of the government’s performance in helping people get out of poverty (44% good, 45% bad); only 22% of Republicans rate the government’s performance as very bad. There is bipartisan criticism of the government’s performance in managing the immigration system: Majorities of Democrats (67%) and Republicans (59%) rate the government’s performance negatively. Both liberal Democrats and conservative Republicans are highly critical of the government on immigration (50% of liberal Democrats say it does a very bad job, as do 43% of conservative Republicans). As noted, majorities say the government should play “major role” on all 12 issues included in the survey. Nearly all who do not think the government should have a major role say it should have a “minor role.” Very few – no more than about one-in-ten – say the government should have “no role at all” on these issues. Republicans are more likely than Democrats to say the government should have no role on some issues, though the shares of Republicans saying this are small. On ensuring access to health care, for example, 20% of Republicans say the government should have no role at all, compared with just 2% of Democrats. In general, opinions about the government’s role in specific areas have not changed much since 2015, but there has been an increase in the number favoring a major role for the government in helping people get out of poverty. Currently, 67% say the government should have a major role in addressing poverty, up from 55% two years ago. The shares saying the government should have a major role have increased among Republicans (from 36% to 44%) and Democrats (from 72% to 80%).